When most of us moved to the Arabian Gulf state of Qatar, in 2005 or earlier, our family and friends thought we were in Dubai. Doha become a buzz word in the international community after that infamous 2010 World Cup bid to host the games in 2022. This summer, in the middle of Ramadan, during soaring temperatures, and swirling dust storms, my host country is in the headlines again. In the middle of our annual summer trip home, there is less of what has become the familiar chit-chat. Thanks to geo-political activity in the region the questions have circled back to echo the early days of moving there. It’s no secret that Qatar’s closest neighbors, once allies, are now playing a very different role in the region. If you don’t know much about the Gulf Cooperation Council (GCC), the accusations of harboring terrorists, funding groups, and being too independent for their own good, would sound persusassive. The allegations against Qatar are like the proveriable pot calling the kettle out considering the roles citizens of other GCC countries have played in terror events around the world. Here’s what you should know about this place that I and hundreds of thousands of other expats consider our second home. Like most of the developed world, the Qatari government has the wisdom to pour their oil wealth into their greatest asset – their young people. Since 1998 the Qatar Foundation for Technology, Science and Education has created universities, secondary schools, blood banks, entrepreneurial centers—this list could go on and on and on—because there are indeed that many centers of innovation. They all have one goal in mind—to build human capacity. That’s why I’m there. I teach literature and writing to students who want a competitive education, many of them sitting in classrooms with students of the opposite gender for the first time. Education is one arena where Qataris demonstrate again and again their willingness to discuss, to engage in dialogue, and to debate, starting from the highest levels of government, to the administrators, and on down to students. Having worked at five of the six universities in Education City, I know that these campuses are beacons of pluralism and play a central role in the advancement of Qatari women—a group that already enjoys more privileges than their neighbors to the south. I moved to Qatar as a single South Asian American woman and immediately felt safer than I had in most North American cities. I got a rental car and learned how to navigate the city (as soon as I realized being driven around wasn’t as glamorous as it sounded—more like wasting minutes of your life waiting for someone to pick you up). In most business dealings, I sit at tables full of male colleagues twice my age and am treated with courtesy and respect (much more so than by other expat women—another story for a different time). Women can vote and run for political office. Some of the most prominent roles in education and the arts are held by Qatari women. Most of my Qatari friends speak more languages (4) and have traveled to more countries than I have (20+). Being from a small, peninsular state, they have long been accustomed to seeing the world, whether London, New York or Paris. Whenever I see one particular former student who took Modern South Asian literature with me, he never fails to mention the first book we read in that class, an Indian historical family saga. Our oldest son thinks our neighbor Mohammed is his cousin because the two of them were born a week apart and now they sit together on the bus. Multicultural society aside, the funds not being put into education are going full force into film, museums, medicine and sports. 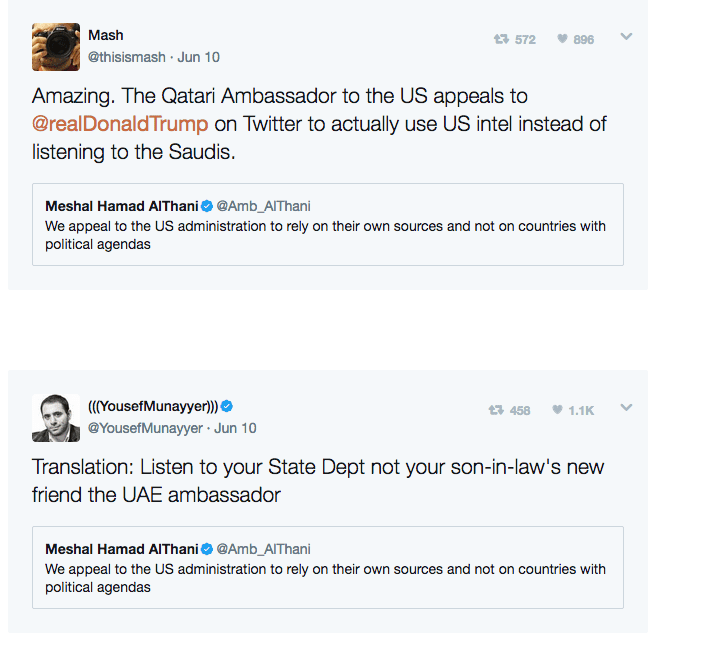 You probably won’t hear any of this in the aggressive suggestions of interference by Qatar’s neighbors. Qatar isn’t perfect. Then again during this period of global political change, who, (besides Canada) can say they’re anywhere close? Then again during this period of global political change, who, (besides Canada) can say they don’t have extremists among them? What is abundantly clear to those of us who have lived and worked here in the Middle East is that Qatar is necessary for a peaceful and stable region. They are already becoming a microcosm of all that we hope for. For this they deserve support. Not ostracisim.